How do you beat the winter blahs? It’s cold and dreary outdoors. The holidays are over, your house seems a little bare. Flowers do more than just brighten your home. They actually have a brightening and uplifting effect on your mood, too. Research has shown the impact is more powerful than a bar of chocolate! Welcome to MONDAY MORNING BLOOMS! If you have come here via my friends Shirley, Pam or Mary…. I’m so happy to see you here, and hope you will stay a while. 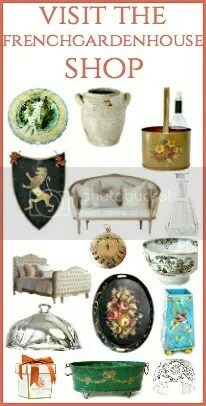 I’m away at market this week sourcing products for our FrenchGardenHouse Gift Collections. I’m showing you photos of a table I set a while ago. It was set with a family dinner in mind. I chose bright, happy flowers in pinks and a soft apricot color. It’s my take on a traditional mixed bouquet. Here at FrenchGardenHouse, I like to keep my flowers in the same color family. But you can mix colors to your taste in your mixed bouquet. DO combine bunches of different flowers. Put room temperature water in your vase, and add flower food if desired. If using a clear glass vase, I just add a few drops of bleach to keep water clear. Begin with the greenery. Strip every leaf off that will be in the water. Then criss-cross the stems in the vase. This creates a collar around the top of your vase that will support the flowers. And it’s a grid-work for your flowers too. Make sure you’ve cut your flowers at a slant and the stems are at most 1-1/2 x the height of the vase. Arrange your flowers one by one, inserting them in your greenery. Step back, re-fluff if needed, and ENJOY the beauty! 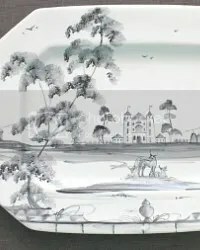 This table features my very favorite hand painted dishes, they are so exquisite! The clear glasses I’ve had forever. And our hi-lo secret, I picked up the black stemmed goblets at a dollar store. Shh…don’t tell my fancy antiques and luxury linens! They can be a little snobby. To visit my inspiring Monday Morning Blooms friends, click on their links below. Lidy..the arrangement is perfection! The colors would make anyone or any day happy. I can imagine your guests just feeling a sense of happy sitting at your gorgeous table. LOVE those dishes…they remind me so of a Juliska pattern that I adore!…and I admit I have some pretty goblets from the Dollar Store too!…I will think of you in the California warmth as we head into the teens…but warming up in a few days!…Have a fabulous day friend!!! Thank you for another gorgeous MMB day putting a smile on our faces!!! Such extraordinary beauty Lidy. 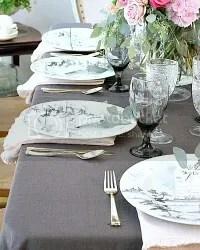 I love the gray cloth with the dishes and then the fabulous arrangement. Yes, this is much more satisfying than a chocolate bar. Simply beautiful. Such a beautiful table and arrangement, and I always appreciate you tips and tricks! Your arrangements look so natural and effortless, and lovely. I am not a fan of stiff perfect symmetrical flowers! Thank you so much Jenna! Flowers always make the day better, don’t they? 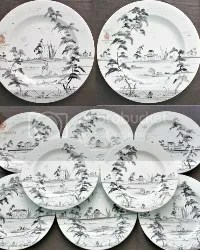 Shirley, that Juliska pattern was actually designed by Deborah Sears, the designer of the plates we sell at FrenchGardenHouse, to be a less expensive version of her own original line. I love her designs – they are inspired by antique Delft pieces. Happy Monday Morning Blooms to you, friend! Lidy, your floral arrangement is breathtaking! It is just the thing to brighten up a winter’s day. The table you set is just beautiful and would make any guest feel honored. Happy Monday!!! Your flower arrangement is so beautiful! LIdy, Floral perfection! What a beautiful table and the floral centerpiece is the star! I love the way your flowers stand out on the backdrop of a calm table. Brilliant! I’m going to remember the “collar” tip! Lidy, I am swooning over this arrangement and your lovely tablesetting. Your choice of color is so appealing to my eye. With the dark gray of the cloth, the hand-painted dishes sing a happy song. I love that you always share tips and how-to’s! I can always count on you my dear friend for inspiration. It is always a pleasure to share Monday Morning Blooms with you! Loved looking at all the beautiful floral arrangements. The winters are so cold and long here in Wisconsin. I love to stop at the florist, or sometimes just at the grocery store floral department and pick up different bouquets of different flowers and arranget them in one of my prettiest cut glass vases. It does the soul good to see some beautiful works of nature all gathered together, and brightening up my gloomy day seeing the centerpiece I created, sitting on one of my table’s. It reminds me that Spring isn’t that far away. I will then be able to pick some lovely blooms out of my own garden. I’m swooning, Lidy!! Every bouquet is so pretty. I’m doing arrangements for my daughter’s bridal shower, and for the wedding…the outdoor tables for the after-ceremony cocktail hour (outdoors), and I’m flipping out. She wants natural and casual…she’s very laid back. Any suggestions? So beautiful, Lidy! I can see the great color now (I thought it was a Brian time on IG). Everything is just stunning! And my favorite? That you got your black stemmed glasses from the dollar store! Thank you for sharing that hi-lo with us! What a fabulous flowers bouquet!You are an artist and I am your FAN! Thank you so much Maristella! You are so kind to say that, and the feeling is mutual.